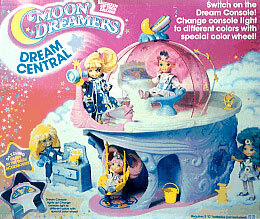 Moondreamers were produced by Hasbro in 1986, and were very short lived. 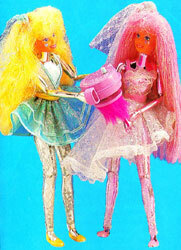 The dolls were all outfitted in a celestial theme, using lots of lamé and metallic fabrics as well as glow in the dark elements. 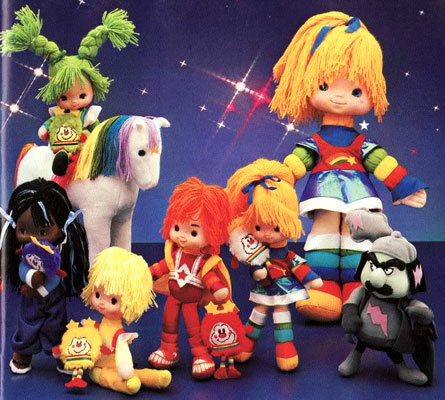 In addition, their hair glowed in the dark, and they all had stars in their eyes. 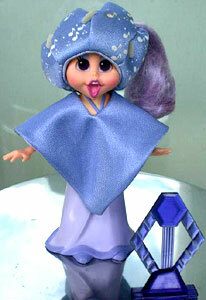 Each doll also came with a figure stand and jewel necklace. 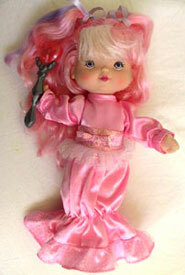 Later releases came with "Dreamtails" instead of jewel necklaces. 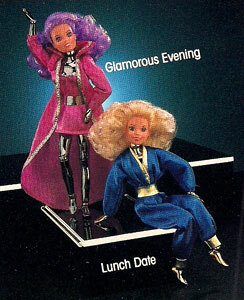 It is interesting to note that the Hasbro catalogue for 1988 had many new Moondreamer dolls and accessories which were never produced, a great source of wonder for Moondreamer collectors! 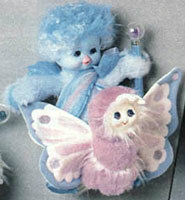 As well as the dolls, there was an animation, accessories, playsets, books and an annual. Images on this page thanks to nijirain! 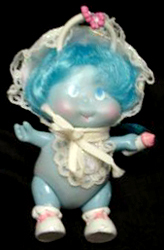 View all Moondreamers on eBay.com or eBay.co.uk! There were two playsets produced. "Climb on board this magical floating bed that sails through the sky! It's a special playset for the Snoozers and Sleep Creeps, but other Moondreamers can go for a ride, too! 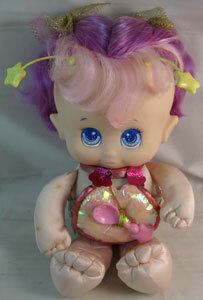 Mischievous Ursa Minor, the bear's adorable niece, mans the wheel or peeks through the star hatch. The Moondreamers use a negatron computer behind the pillow to chart the amount of negatrons in the universe. A Snoozer or Sleep Creep can take a nap in the trundle bed or snuggle under the bedcovers!" Dream-A-Long Drifter has lots of glow-in-the-dark features, including 3 black hole covers, ship's wheel, alarm clock, binoculars, chair and labels. Bed also come with 3 beg bugs, sail, trundle bed, whistle, star hatch and blanket. 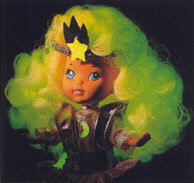 Ursa Minor, included in the playset, has glow-in-the-dark decorations, too! "A dazzling place where happy dreams are made! 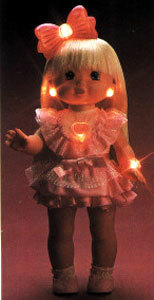 As night approaches the Moondreamers can gather around the Dream Machine to prepare happy dreams for sleeping children. In the Domed observation deck, a Moondreamer can sit at the lighted console to design new stars and chart the amount of positrons in the universe. There's even a fun swing they can ride after their nightly work is done! The home base for the Moondreamers and their friends has a workshop, bedroom, Dream Machine, swing and observation deck with console area." Dream Central features a lighted console that changes colors when children turn the color wheel! Glow-in-the-dark accessories include stars and moons, swing, 5 planets, 3 beakers, jar and decoration labels. 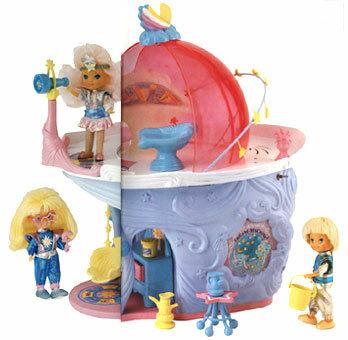 Playset also comes with pail, telescope, star and moon ring, chair, bed and table, Workbench, Starry Up globe and star adjuster.